Spring is my favorite season! I love the lift in energy and mood that comes after a dark, brooding winter and the blush of cherry blossoms, birdsong and peppering of flowers throughout the city never fails to make me smile. This spring I noticed rhubarb at the local market. 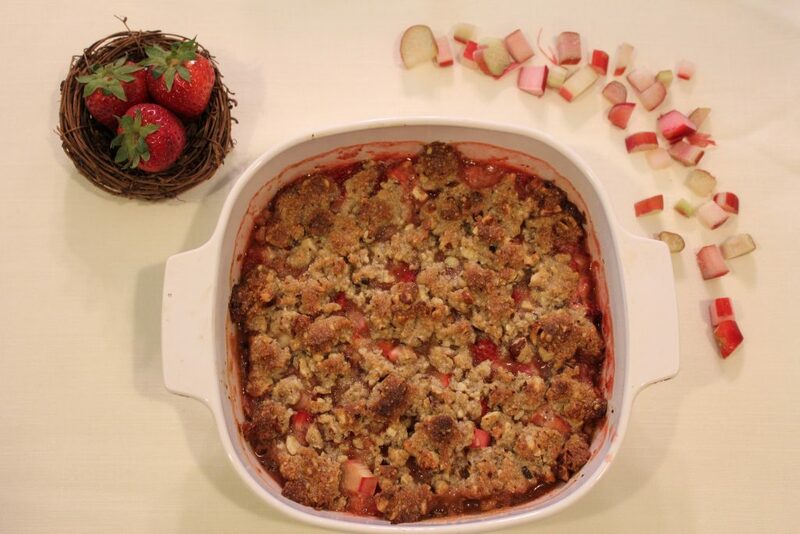 Rhubarb has such a short season but is a quintessential flavor of spring sweets. 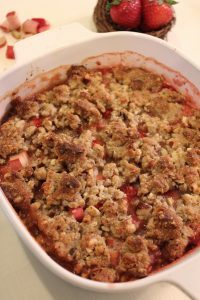 I pulled this strawberry rhubarb crumble together off a mash-up of various internet recipes coupled with what I had in my kitchen. The result is sweet, tart, and delightfully crunchy. Enjoy! Grease a 9″ by 9″ square casserole dish or pie plate. Mix all filling ingredients together and pour into the casserole dish. Mix all crumble ingredients together (ideally with your fingers) until all is well incorporated and has a crumbly texture to it. Sprinkle the crumble on top of the fruit and bake at 350°F (175°C) for 25 minutes or until filling is bubbly and crust is browning nicely. Serve with vanilla ice cream or keep it paleo with a whipped coconut cream (by chilling a can of coconut cream overnight and whipping it in a blender with 1/2 tsp vanilla before serving) or cashew cream. Grind nuts to a fine meal in a small coffee grinder or food processor (no lumps or there will be lumps in your nut cream). Put ground cashews, maple syrup, and vanilla in the blender. With blender running, add water a little at a time until you have a thick creamy consistency. Will You Be the Next Diabetes Case? Earlier this year I kept hearing a well known doc in the functional medicine space proclaiming that half of Americans were diabetic or pre-diabetic. I’ll be straight with you – at first I thought it was an exaggerated claim made by skewing the research. Then I heard it again from someone else that I perceive to be a bit more grounded. So I decided to get to the bottom of this ridiculous claim – only to find it was accurate. 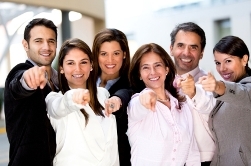 There are 2 pre-diabetics and 1 diabetic in this group – but they all think it’s gotta be you. 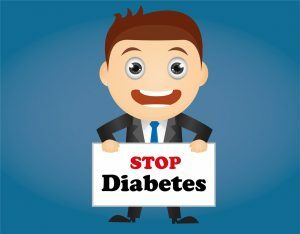 According to the United States Centers of Disease Control, 10% of American adults are already diabetic and 35% of Americans have beginning stages of the disease (pre-diabetes). This means if you are reading this in a room with at least one other person, one of you is likely that statistic. If you are pre-diabetic and do nothing, you will become diabetic within 5 years’ time. This is bad, bad news, people. BAD NEWS. Diabetes is very expensive and terribly debilitating. Diabetics often end up blind, with heart disease, or even lost digits and limbs. Diabetes is also the largest cause of kidney failure in the USA. Diabetes isn’t just about having your blood sugar out of whack. It takes a steady, damaging toll on the rest of the body. 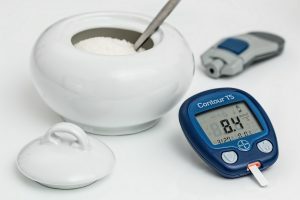 The typical form of managing it – with insulin – often leads to weight gain (which ironically leads to increasing insulin resistance and heart attack risk) and insulin itself is very hard on the body when chronically elevated. Type 2 Diabetes – the kind most adults have – is a disease of lifestyle. This is not about ‘faulty genetics’ although you may have a genetic predisposition. This is about living a lifestyle and consuming a diet that the body cannot handle. With nearly all chronic disease, we can think of genes as the weapon and lifestyle being the finger that pulls the trigger. Type 2 Diabetes can be put into remission through diet and lifestyle, especially when caught early. If you are diabetic or pre-diabetic, your doctor may or may not have mentioned this to you. This past weekend I met two diabetic women – one was not given ANY nutrition information to manage or improve her condition and the other was told information that actually made her condition much worse (eat a high carb, low fat diet). The second has since discovered a different way of eating which has caused her to lose the 70 pounds she gained on insulin and is slowly improving her diabetes after 30 years with the disease. Clinical research shows that newly diagnosed diabetics can achieve remission in as little as 4 months. For those who are still children (type 2 diabetes now comprises 45% of all diabetes cases in children) glucose levels can be stabilized in as quickly as 90 days and many achieve remission that lasts at least 2 years (ie – until the study ended). The same results can be seen with pre-diabetics. I have witnessed normalization of labs within a 90 day window. Diabetes treatment costs over $13,000 per year. This is not something our health care system can afford and we needn’t be burdened by the cost at all as the disease is totally preventable and can be improved or put into remission through lifestyle changes. By taking the traditional route of management through medication complications will arise as the disease progresses. Medications to control cholesterol, blood pressure, and stave off heart disease pile on as the body wears down. This has become so commonplace in our country that many think of it as an inevitable part of aging. Given these recent statistics, I urge you to get some key labs done at your next check-up. Ask your doctor to test for Hemoglobin A1C (HgA1c), fasting glucose, and fasting insulin levels. Hemoglobin A1C is a marker for chronically elevated glucose levels and will let you know if you have had high glucose for 3 months or longer. Your fasting glucose and insulin is a snapshot of existing levels in the blood at the time of the lab draw. C-Reactive Protein (Crp) is also a good marker to test for, as it indicates overall elevated inflammation in the body, which can drive both diabetes and heart disease. If you have not had a physical in at least 2 years please schedule one. Prevention is so much easier to work with than disease. For those who knowingly have pre-diabetes or diabetes, you can take back your health by switching to a higher fiber, higher protein whole foods diet and by getting in regular exercise. You’ll need to eat a lot of colorful vegetables to reduce inflammation and stabilize blood sugar levels. Exercise is crucial as well; you needn’t get a membership at a Crossfit gym – even walking facilitates insulin sensitivity and both reduces the risk of diabetes and facilitates remission from diabetes. The most important thing is to get moving in whatever ways you can and to switch your diet immediately to reduce further damage and allow the body to normalize. If you’d like to talk further about how diet can impact diabetes please schedule a complimentary 15 min Discovery Call with us! Centers for Disease Control and Prevention. (2017). New CDC report: More than 100 million Americans have diabetes or prediabetes. McInnes, N., Smith, A., Otto, R., Vandermey, J., Punthakee, Z., Sherifali, D., … & Gerstein, H. C. (2017). Piloting a remission strategy in type 2 diabetes: Results of a randomized controlled trial. The Journal of Clinical Endocrinology & Metabolism, 102(5), 1596-1605. 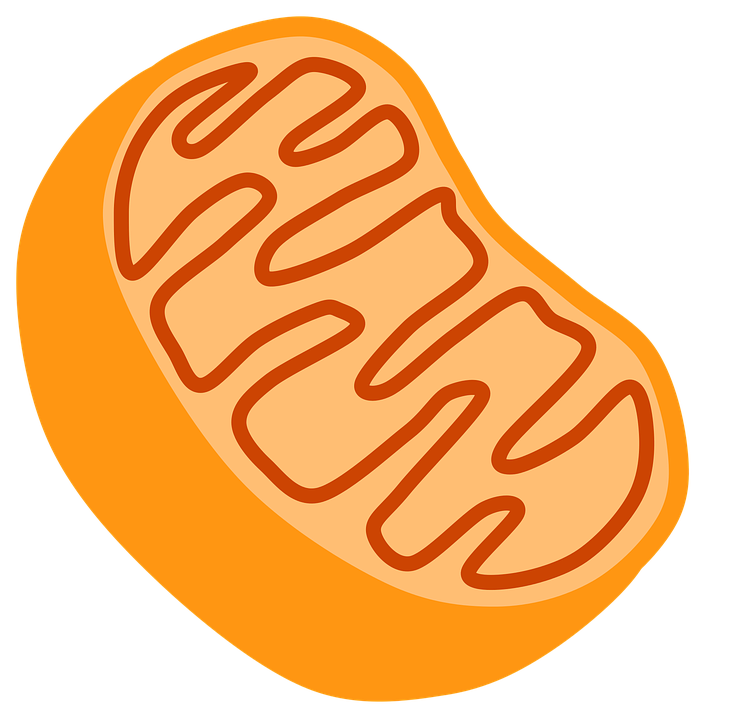 Mitochondria aren’t just ‘the powerhouse of the cell’! 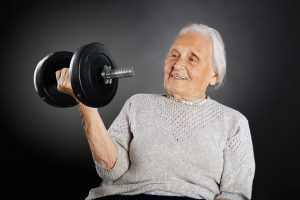 The foundation of mitochondrial health isn’t especially glamorous or complicated – the basics of good health will do a great deal to help your mitochondria. Our ’10 Weeks to a Healthier You’ online program is an excellent way to assess your overall habits and improve the foundations of health specifically in the areas you need the most. This free program is delivered into your email inbox once a week to allow you time to implement each pillar of health so that you can have a notable, powerful improvement in your health at the end of 10 weeks! Enroll here! Yes! I’m ready for better health! Sign up here for 10 Weeks to a Healthier You! Asparagus is a member of the Lily family, so it makes sense that it would emerge as one of the signs that spring is finally here. It is high in fiber, folate and potassium. Asparagus contains bone-building vitamin K along with many antioxidants, including vitamins E, A and C as well as saponins – a type of phytonutrient demonstrating anti-inflammatory and anti-cancer properties. They are also beneficial in maintaining blood pressure, regulating blood sugar, and controlling blood lipid levels. Fun Fact: The growth rate of asparagus can reach as much as 1 inch per hour. In ideal weather, asparagus grows very fast, keeping farmers busy harvesting the spears daily if they want to keep them from turning into large inedible plants. It’s a pretty labor intensive crop, which is one reason why it tends to run on the expensive side. 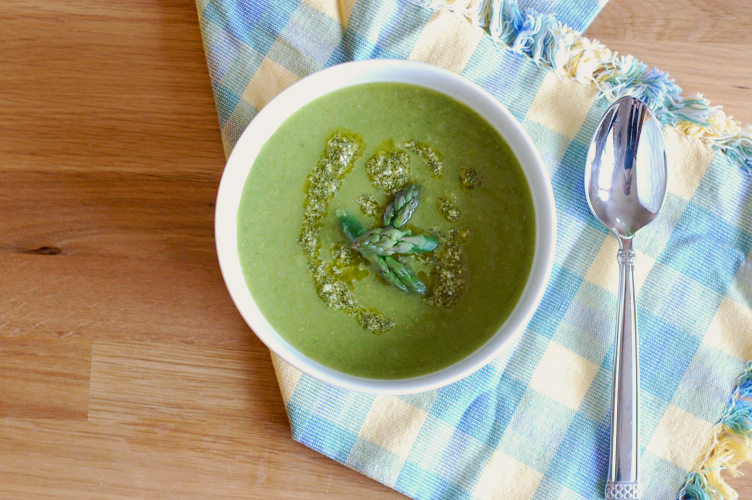 This asparagus soup is fabulous on the early hot days as spring begins transitioning to summer. Really though, it just screams spring and should be enjoyed as soon as you can tolerate the thought of a lukewarm or chilled soup! I love making it as a celebration to the lengthening days and beautiful blooms that are brightening up the city. Enjoy it often, and share it with friends. Melt butter in heavy large saucepan over medium heat. Add leek and potato; sauté 2 minutes. Add broth; bring to boil. Reduce heat to medium; cover and cook until vegetables are tender, about 10 minutes. Add asparagus. Simmer uncovered until asparagus is just tender, 5 to 6 minutes (depending on thickness of stalks). Remove pan from heat. Transfer 8 asparagus tips to small bowl for garnish. Working in batches, puree soup in blender until smooth. Season to taste with salt and pepper. Divide soup among 4 shallow bowls. Freeze 15 to 20 minutes to chill quickly. To make Pistou: add the garlic clove, salt and walnuts and into a small food processor and pulse a few times. Chop or tear the herbs into smaller pieces, and add them to the processor with the lemon juice, pulse until everything is coarsely combined. Add a generous pinch of pepper and red pepper flakes and the extra virgin olive oil. Again, a few more pulses to combine. Add 2 tbsp. pistou to the coconut milk and drizzle atop the soup. Decorate with asparagus tips and serve. NOTE: My 4 year old who snubs most veggies ate this!